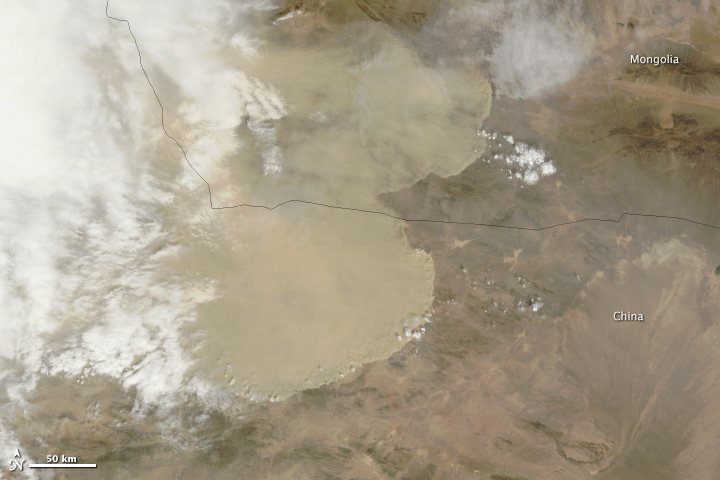 A wall of dust was barreling across northern China on April 23, 2014, when the Moderate Resolution Imaging Spectroradiometer (MODIS) acquired these images from NASA’s Aqua and Terra satellites. 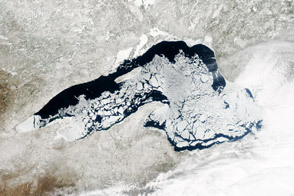 The top image was taken at 12:35 p.m. local time, and the lower image is from 2:20 p.m. 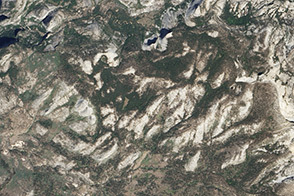 Turn on the image comparison tool to see how far the dust advanced in the two hours between images. 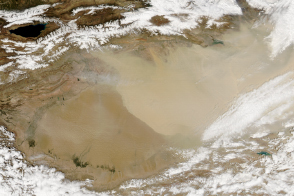 Dust storms are common in the deserts of northern China, but they peak during the spring when large storms and weather fronts move in from Siberia. In this case, a very large front appears to be pushing east across Asia, kicking up dust ahead of it. 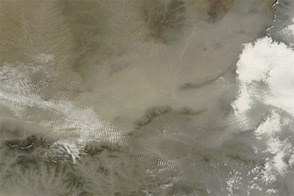 On the ground, the dust brought visibility down to less than 50 meters (160 feet), veiling parts of northwest China in yellow haze. 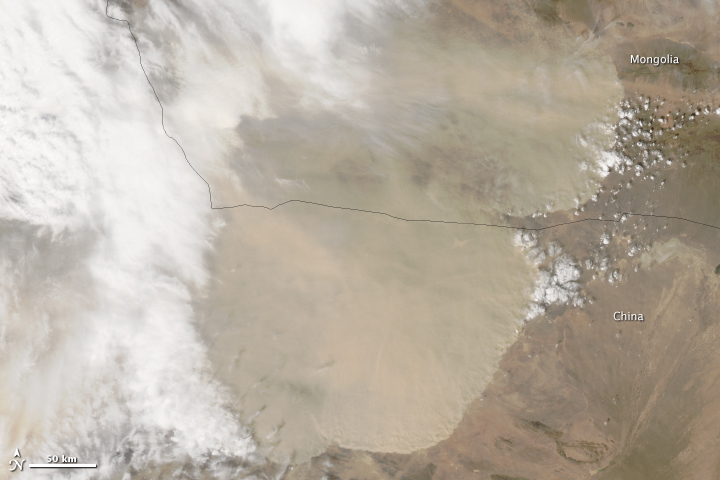 The winds and resulting dust are widespread, since a dense airborne dust plume is visible under the clouds throughout the scene. 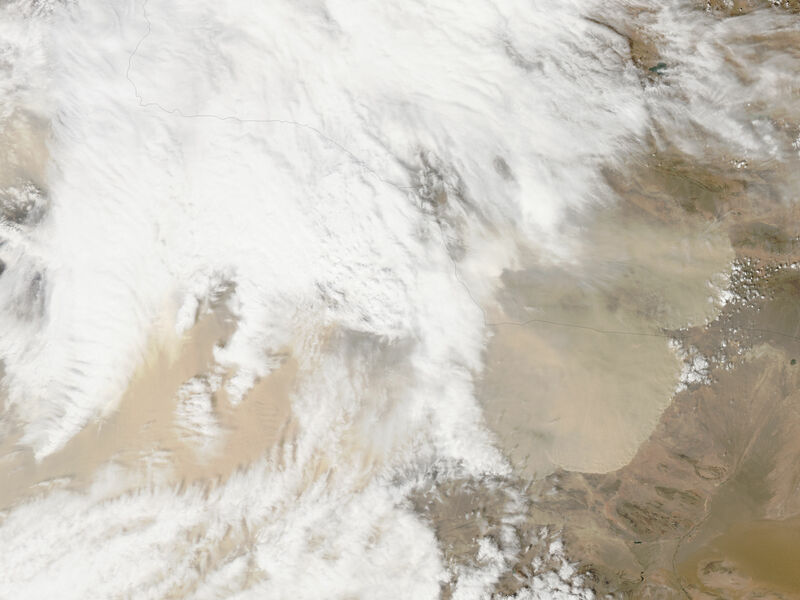 The large storm also extended to the Taklimakan Desert (immediately southwest of the area shown here) on April 23, April 24, and April 25. 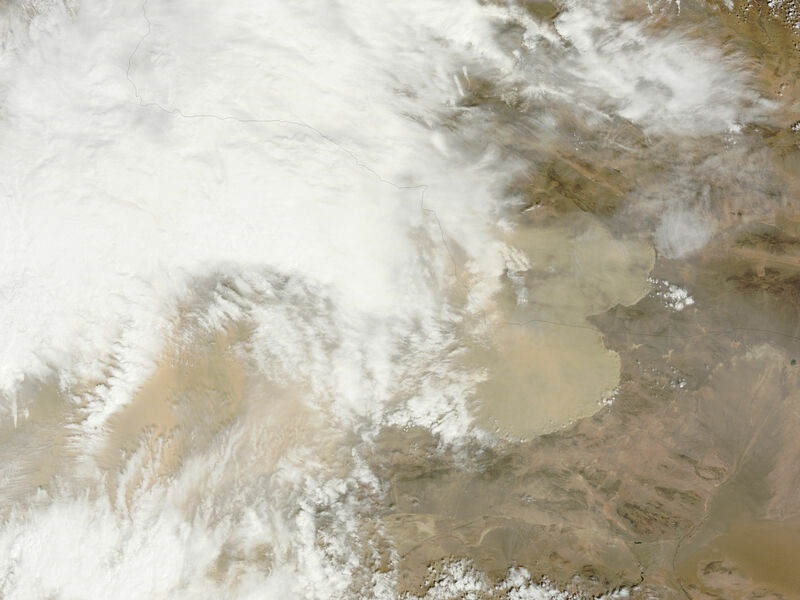 A large weather front kicked up dust across much of northwestern China. China’s big dust storms are most frequent in the spring. AccuWeather.com (2014, April 23) China satellite. Accessed April 23, 2014. Prospero, J.M. et al. (2002, September 4) Environmental characterization of global sources of atmospheric soil dust identified with the Nimbus 7 Total Ozone Mapping Spectrometer (TOMS) absorbing aerosol product. Reviews of Geophysics. Accessed April 23, 2014. Xinhuanet (2014, April 23) Sandstorm hits NW China’s Gansu. Accessed April 23, 2014.